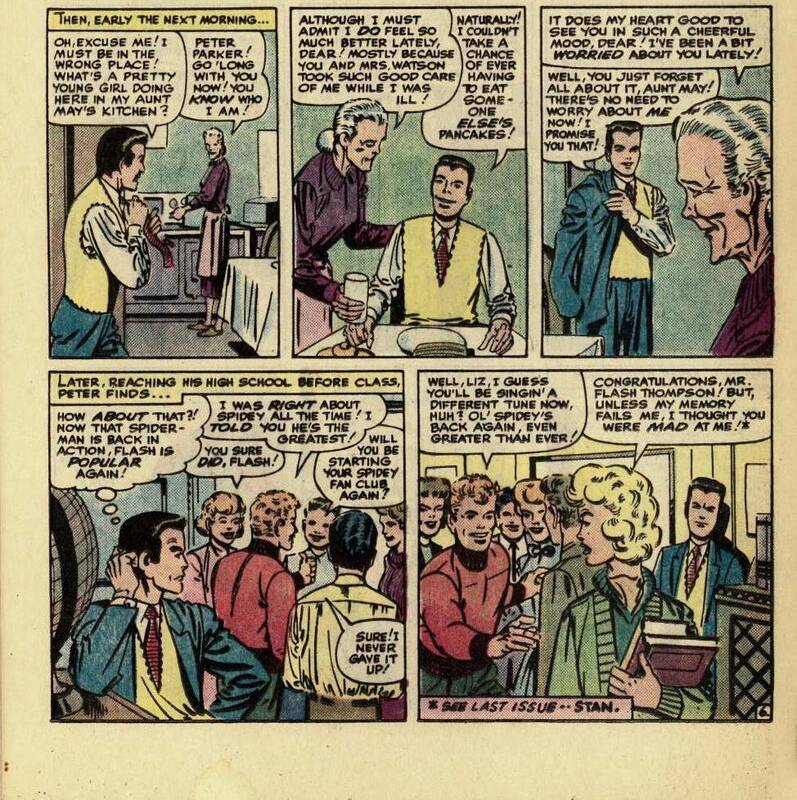 A Tribute to Marvel's Assistant Editors' Month! 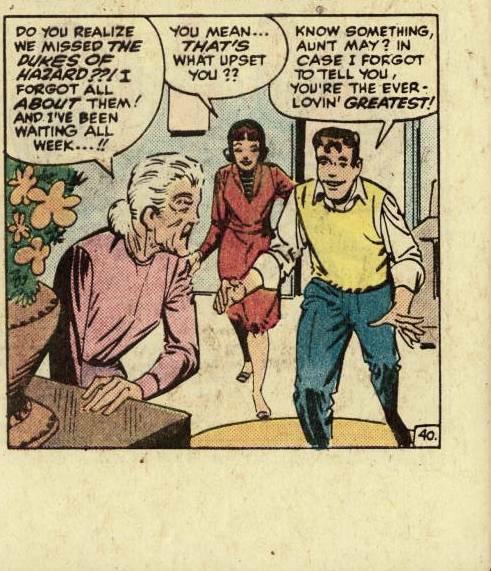 This time Spider-Man makes his first of four visits to Assistant Editors' Month Online! The Assistant Editor at the time was Bob Denatale. If you visit his website, you'll see that he has left comicdom and has worked as a musician, stage performer and filmmaker. 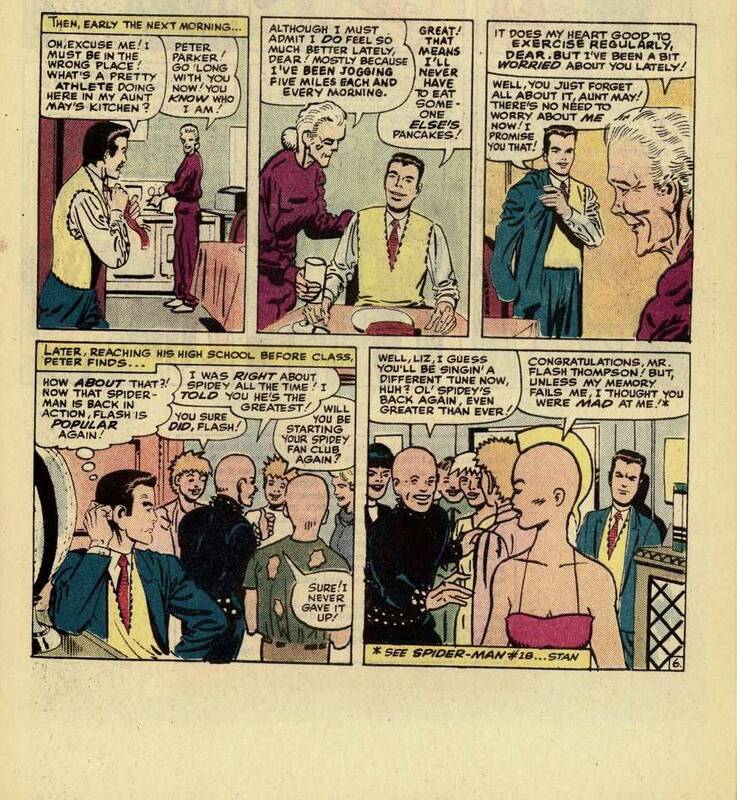 Denatale was "filling in" for Danny Fingeroth, who was Editor on all the Spider-Man titles at this time. 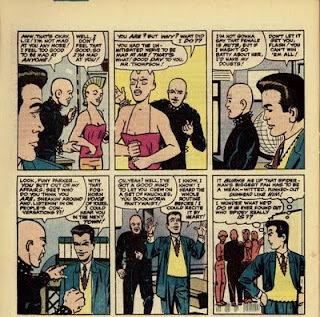 In case anyone doesn't know, 'Marvel Tales' was a long-running reprint series, issue #1 came out in 1964, the final issue was cover dated November 1994. 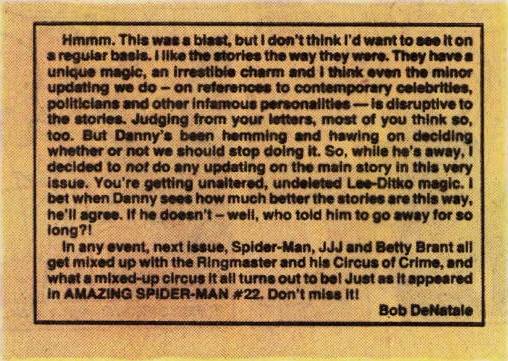 In the beginning, the series reprinted adventures of multiple Marvel characters, but Spider-man was the only constant. 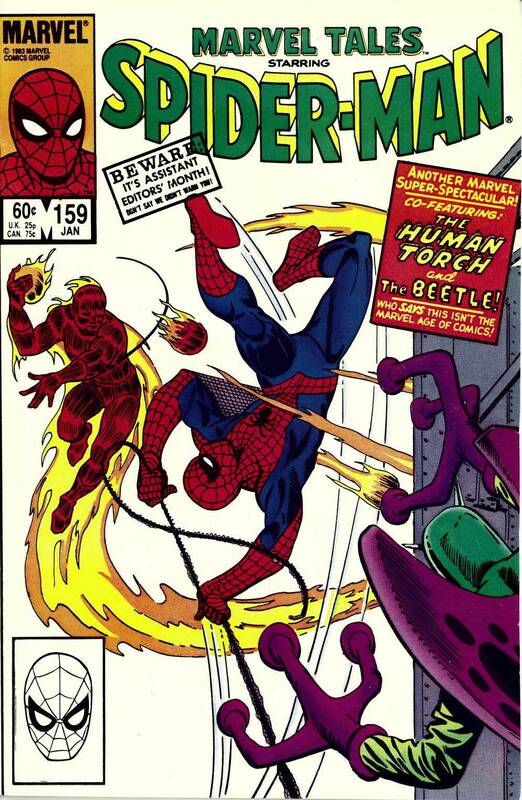 Beginning in late 1981, the series was "rebooted" and went back to the beginning, reprinting Spider-man's first appearance from 'Amazing Fantasy' #15, and continued reprinting early issues of 'Amazing Spider-Man', featuring the first appearances of Spidey's classic villains and Peter Parker's struggles to fit in at Midtown High. 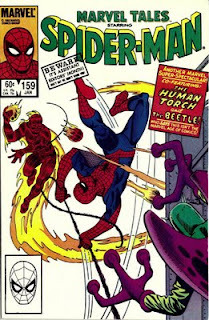 It was a great way for 80s kids like me to read classic Spider-Man stories written by Stan Lee and drawn by Steve Ditko. In the original story , 'The Beverly Hillbillies' was the show she missed. 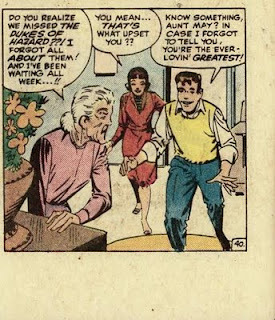 Which brings us to #159, which reprinted 'ASM' #21. 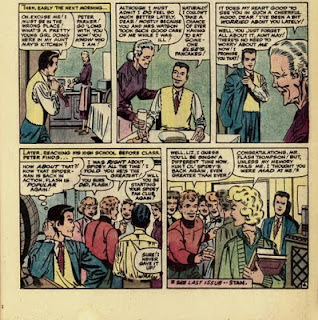 How much "damage" can an Assistant Editor do to a comic that simply reprints an old Lee-Ditko tale? That's exactly what Denatale does! 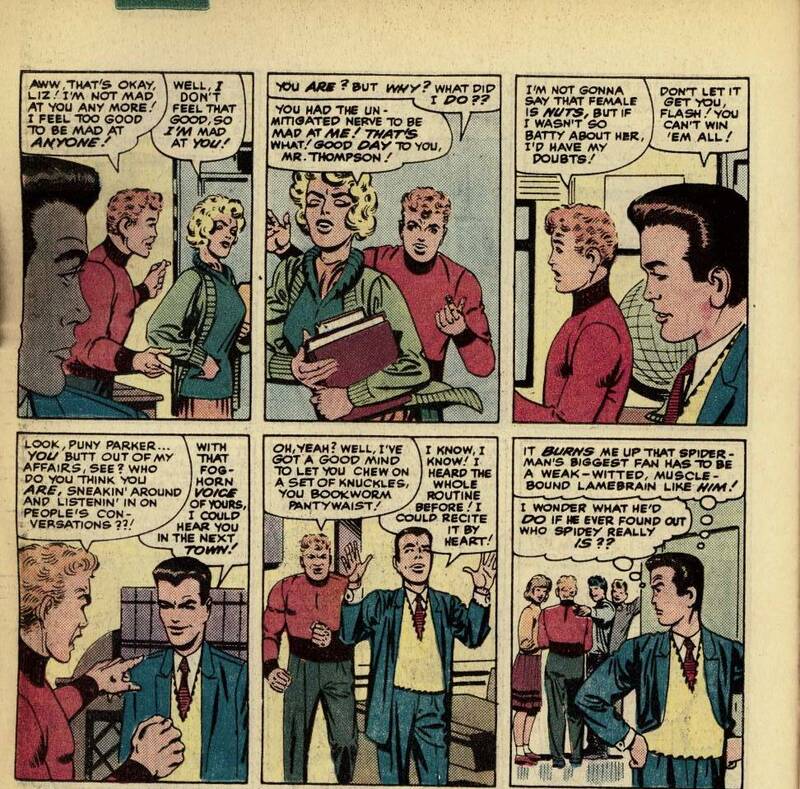 You'll notice Aunt May is wearing sweats, Liz Allan has a mohawk and Flash Thompson is a skinhead punk. 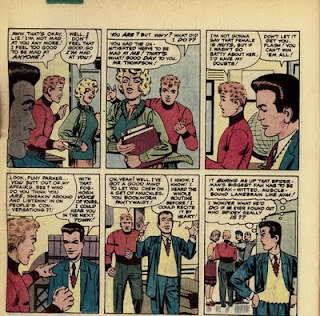 But even in 1983, "Puny Parker" is still rockin' the sweater vest! 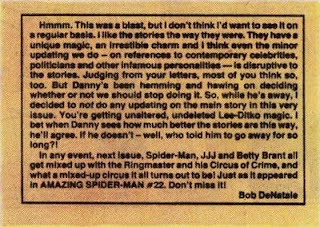 I think he's right about not changing the stories and I believe they never added another "update" to reprint stories after this. But I'm glad that Denatale & co made sure 'Marvel Tales' participated in AEM! 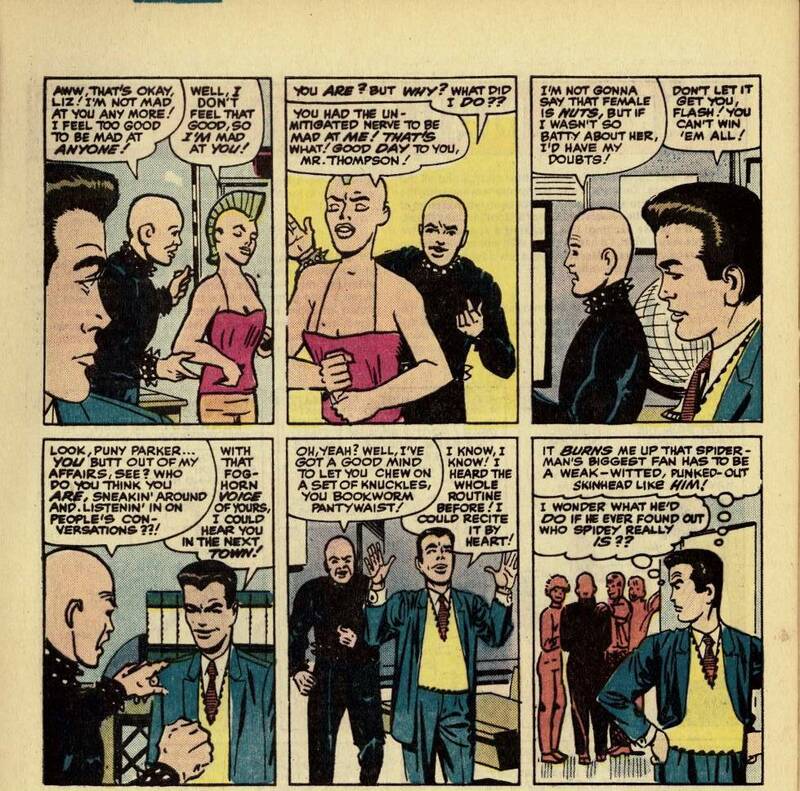 In our next installment, we'll look the first and only appearances of Bernie America and Moskull! The punk versions of Liz and Flash are beyond awesome! With everybody else in 60s gear - killin' me. Missed this the first time around. Also like that you identified Zeck & Beatty on the cover in your Cap post. Never knew that was them, and they rocked everything they touched in the 80s. Someone should get that team back together. Since you're really digging into these, can you clear up this mystery: I have two copies of Thor 339 - where Beta Ray Bill gets his own God Hammer. One of them has the Assistant Editor 'Surgeon General" warning on it, and one has a UPC like any other comic. What gives? Is it some distribution thing? Or am I going to sell my uber-rare 'UPC Variant Edition' on eBay for a million bucks? Mars, I'm not sure about 'Thor' #339. My copy has the UPC code, not the AEM warning. Looks like the "Direct Sales" cover has the AEM warning. So you're right, distribution variant. Looks like you can get between $1 and $3 on Ebay for 339. Sorry. Thanks for stopping by, I checked out you blog & added it to my links. Nice Kirby art! Thank you! We see now how the issue number/price boxes are different, indicating direct sales or news stand. Ah ha! Glad you enjoyed the Kirby art we're celebrating this summer, and thank you for the link. We shall return the favor! The Brave And The Bold:The Lost Issues! All images are presumed copyright by the respective copyright holders and are presented here as Fair Use under applicable laws; They will be removed if said copyright holders ask me to do so.